If you check out the ranks of the C-Suite, Men hold 92% of the top leadership roles of Canada's 100 largest publicly traded companies. Of those 100 companies, 66 have zero women in senior executive positions. These trends are part of the reason behind the pay gap. Women working full time in Canada earn 88 cents for every dollar their male counterparts make. Compared to other industrialized countries, Canada gets a failing grade when it comes to equal pay. Our gender pay gap is the 7th largest among the top 34 advanced economies. 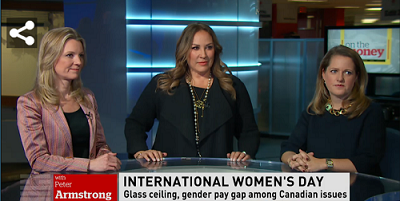 Jennifer Reynolds, President and CEO of Women in Capital Markets, Carrie Kirkman, Chair of Girls 20 and Andrea Stairs, Managing Director of eBay Canada discuss Canada's gender pay gap and the need for board diversity.